What should be done with the elderly when they become a drain on the younger members of a family? One apparent answer, a longtime part of Japanese folklore, is the tradition of ubasute. This long-abandoned practice is quite literally the same as taking out the trash, only in this case the “trash” are 70-or-older elders of the family. Keisuke Kinoshita wrote and directed the 1958 The Ballad of Narayama about this very scenario. The Criterion Collection edition is now available, putting this rather outré film (even by today’s conventions, but especially for 1958) under a more intense spotlight than it has been in a long time. A masked announcer, rhythmically clacking two blocks of wood together, appears on screen and announces the title directly. It’s a rather confrontational start to a highly stylized film that was shot on an obvious (but painstakingly detailed) set with painted mural backdrops. The quaint village is not placed directly in historical context, but it’s clear the dwellers do not have the benefits of modern, 20th century conveniences. A slow, droning narration is sung rather than spoken, often conveying nothing more insightful than what is being obviously acted-out on screen. Think of Arnold Schwarzenegger’s infamous commentary on Total Recall, only slightly more musical. Orin (Kinuyo Tanaka) is a 69-year-old villager and resident trout-catching expert. Her family is eager for her to make the journey to Mount Narayama. That’s what all the 70-year-olds do, after all; out with the old, in with the new. In essence, Mount Narayama is the world’s least well-appointed retirement home. The villagers’ tradition is carrying the elderly up to the cold, barren mountain and leaving them to die. These are poor people, always on the verge of starving, and these seniors are viewed as nothing more than a burden. Even Orin’s impressive fishing prowess, something the woman is rightly proud of, isn’t reason enough to save her from this ominous fate. The Ballad of Narayama presents this calculatedly cruel tradition as something of a waking nightmare. The nightmare, in this case, belongs chiefly to Orin’s son, Tatsuhei (Teiji Takahashi). He cannot bear the thought of simply dumping his mother somewhere and letting her meet a brutally harsh end, exposed to the elements. The vividly beautiful color cinematography by Hiroyuki Kusuda evokes the feel of Hollywood’s golden age of Technicolor musicals, but the subject matter is quite obviously more troubling. Orin’s grandson Kesakichi (Danko Ichikawa) cannot wait to be rid of Orin. It will leave more rice and beans for he and his wife, Matsu-yan (Keiko Ogasawara). As played by Tanaka, Orin is surprisingly complacent about accepting her fate. She’s willing to martyr herself for what she believes is the good of the family. She even works to make sure her new daughter-in-law, Tama (Yuko Mochizuki), knows her secret fishing spot. On the other end of the spectrum is the painful sight of Matayan (Seiji Miyaguchi), the 70-year-old man who is understandably unwilling to be put out to pasture. His son (Yūnosuke Itō), while perhaps not as happy as Orin’s grandson, doesn’t seem to question the concept of abandoning the elderly and fights to see that his father be taken to Narayama. The overriding theme here is how to handle aging parents and grandparents, with Mount Narayama a metaphor for the antiseptic “homes” in which we are often faced with the prospect of leaving our loved ones. Tatsuhei is arguably too connected to his mother, unwilling to accept the reality of the society he lives in. These old folks do not have a choice in the matter. For the “good” of the younger people, they’re marched off to die. It’s not unlike in Soylent Green, only less humane and without the recycling element. It’s a starkly utilitarian approach; a forced “survival of the fittest” scenario. One cannot help but feel for Tatsuhei, especially given the searing portrayal by Takahashi. Tanaka instills a sense of nobility in Orin, a quiet dignity that flies in the face of such an undignified set of circumstances. The artificial lighting that signifies the change between night and day, the painted backdrops, the Styrofoam snow—all of it is easy to adjust to. But the braying musical narration isn’t quite as easy to swallow, especially when the Japanese lyrics take five times longer to hear then to read as subtitles. But I did find the instrumental score to be quite hypnotic. The traditional Japanese instrumentation takes some getting used to, but winds up creating a trance-like ambiance that fits the inevitability of this simple folk tale (based on the novel Men of Tohoku by Shichirō Fukazawa) very well. 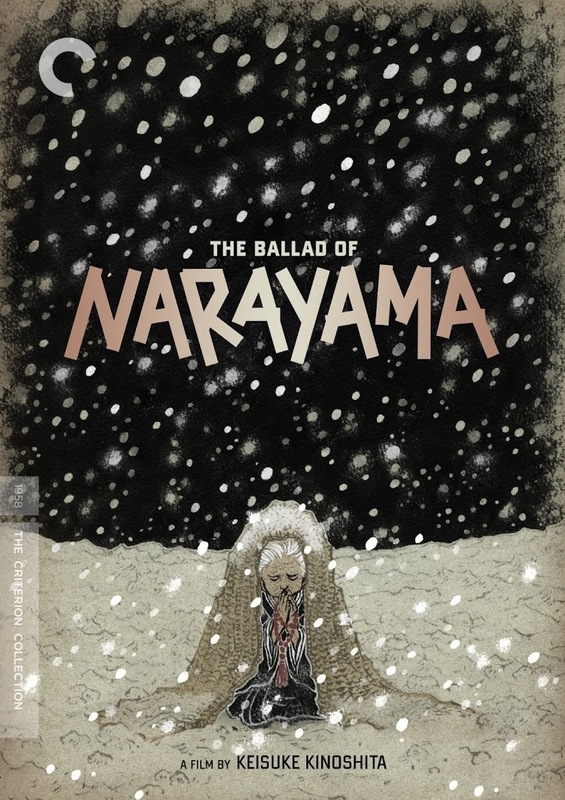 The Ballad of Narayama is not an easy film to watch. Though the most disturbing visual image is Orin’s bloody gums after she loses some teeth, the atmosphere is deliberately queasy throughout as a result of the subject matter. Criterion has kept the DVD simple, adorning it with only a pair of trailers. The booklet contains a lengthy essay by film historian Philip Kemp that is well worth reading.